Get your colours in print to match what appears on screen. Most designers have experienced issues with getting colours in print to match what's on our screens at some point. After picking the colours in your designs carefully – and maybe considering colour theory to influence your colour palette choices – if things don't turn out as expected it can be confusing and frustrating trying to troubleshoot the problem. Thankfully there are a few simple steps you can take to improve your colour matching, thereby reducing the amount of proofing you need to do and avoiding embarrassing delays in delivering print work to clients. Colour matching is the process in which you make efforts to ensure that the colours you see on your screen are accurately recreated when your design is printed. The idea is to ensure that particular colours on screen print with the same hue, saturation and brightness, allowing you to make accurate decisions within your design work. Following these eight steps should ensure colour accuracy in your print projects, every time. Some of the most common colour matching problems faced by designers can be solved easily by improving the working space. Avoiding unnecessary glare on the monitor, working in dark or overly bright conditions, and even the angle at which the screen is viewed can all affect colour perception, leading to unexpected results when work is printed. Ensure you're viewing your screen straight-on, as colour isn't faithfully reproduced by many monitors once you move a few degrees off-centre either horizontally or vertically. Take a look at how your office is set up and remove any very bright light sources that might cause reflection or glare on your screen which may affect the way your eyes interpret colour. There are some limitations to equipment at the cheaper end of the market that will directly impact on your ability to accurately predict print results. Cheap low-end monitors might not reproduce colour accurately across the entire gamut, leading to obvious artefacts and colour-banding in dark areas. Take a look at our buying guide, The best monitors for designers, if you're in the market for a new display. Keep in mind that if you have an eye prescription, failing to keep this up to date can result in your own personal colour perception being affected. It's common for one eye to be more sensitive to particular colours than the other, and failing to wear glasses when you need them can not only cause eye-strain but also affect your ability to judge contrast, brightness and colour. Once you've checked your eyes and got your environment up to scratch, the next item to check is that your screen is accurately reproducing colour. The best way to do this is to calibrate your screen. There are lots of ways you can do this, but the easiest is to buy yourself a calibration tool such as the Spyder5ELITE. 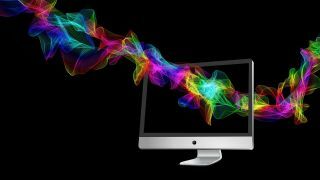 These devices work by measuring the ambient light in your workspace as well as the light emitted by your screen, adjusting the colour space your monitor works within to compensate for both factors and to reproduce accurate colours. This takes all the guesswork out of calibration and makes the entire operation as simple as clicking a button and following the instructions on screen. If you can't stretch to a dedicated device, some home and office printers offer a built-in calibration tool that prints sheets with blocks of colour and asks you to judge which is closest to a colour shown on screen. The process is repeated until your printer is reproducing accurate results, but note that this will only work with that specific printer. You may have noticed that there are several different colour space profiles installed on your computer. Almost every computer uses sRGB by default, while installing any apps from Adobe will introduce the AdobeRGB colour space, and then you'll have various CMYK colour profiles. By working in the appropriate colour profile for your intended output device, you can save a lot of heartache. Our article on 5 things every creative needs to know about print design explains the difference between RGB and CMYK, among other useful tips. As well as printing your work, you can also simulate the printed look in some applications, allowing you to get a semi-accurate idea of how the final printed work will appear. In Photoshop, for example, you can access the proofing options under the View menu. Choose View > Proof Setup and choose from one of the preset options, or if you've got a particular printer in mind you can create a custom profile. This will reflect your choice of printer and paper stock, so don't forget to update the profile when you change your output intentions. Photoshop isn't the only software to offer this option, so check out the online help for your preferred apps and use the proofing tools to get a sense for the final output. If you're attempting to reprint something you've previously sent to commercial printers, or to match an existing piece of collateral, it’s really worth speaking to your printers and providing them with a sample of that previous work so they can colour match at their end. This isn't a way of absolving yourself of responsibility to get the colour right in your file, but different technicians have their own preferred mix of base colours, so to ensure accuracy it always pays to provide reference material. This is especially worthwhile if you're doing large runs or especially complex jobs, and reputable printers will have no issue with you providing samples for colour matching, so long as you're spending more than the cost of a few business cards. For colour-critical applications, such as branding where accurate colour reproduction is essential, consider using a colour library system such as that offered by Pantone. This can feel expensive, especially if you're a sole trader and you've not had cause to buy into the library before: a set of colour-accurate sample chips can cost £100+, and need to be replaced regularly as light causes the colour to fade. The expense is worthwhile, however, when you can show your client the exact colour that their print will use. Plus, a starter kit is more affordable, at under $60/£55. You can also use the approximate CMYK and RGB reference equivalents to accurately pick colours for use in designs without going to the expense of printing a fifth colour. Practically every professional print-orientated application supports Pantone straight out the box, and although there are other libraries out there, Pantone is the best known.